As I write, the sky is pouring snow. It’s still unclear how much we will get and if warmer temps will turn some of the moisture into sleet. Our monthly knitting meeting has cancelled for the second time this month. When it starts to snow this seriously, I hunker down and take pleasure in all my projects–on the theory that some trips are not worth the risk. In this case, it’s not the going, it’s the getting home after several hours of snow. So, as we are deep into February, my wild turkeys are now quite tame. I throw them leftover chicken food, some scratch, and some sunflower seeds. It seems to be my mission in life to feed things. I’ve told you they talk to me–so I took this little video yesterday–a bit after some long conversations had already occurred. And my goodness, you should have heard them this morning. They knew the storm was coming. The males are really starting to display now, and their heads are turning cobalt blue. I will try to get pics of that phenomenon soon. 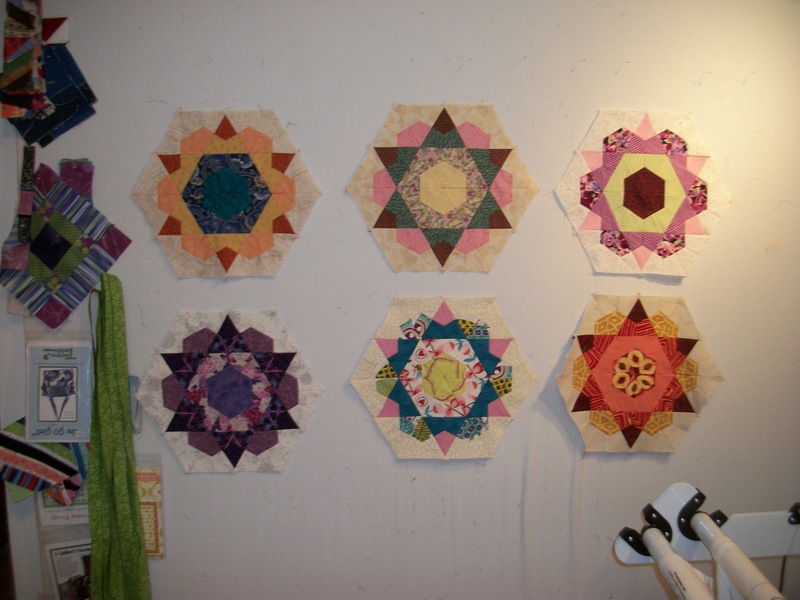 I have six of the 12 needed of these BIG hexies. I am working on the 7th and have two more planned. 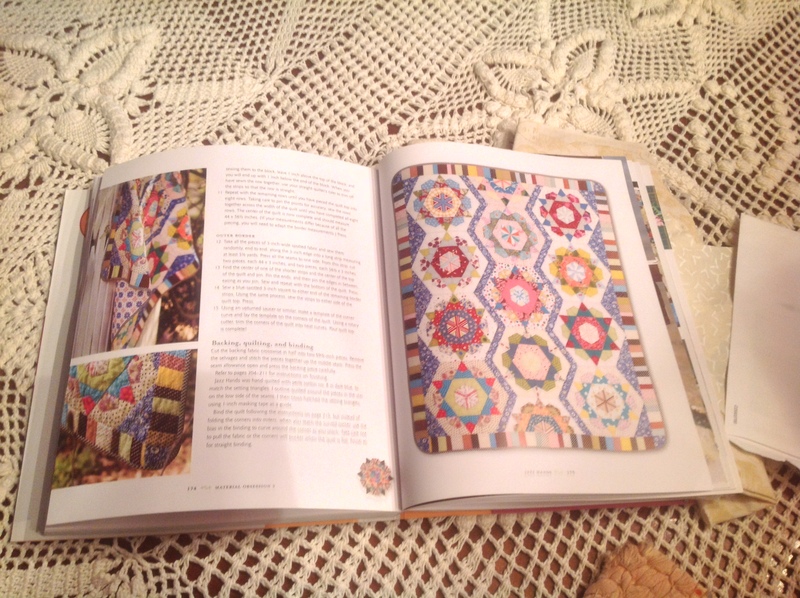 You will recall that this idea/pattern comes from Kathy Doughty and Sarah Fielke in Material Obsession 2: More Modern Quilts with Traditional Roots. Remember these earlier pictures of two different settings? 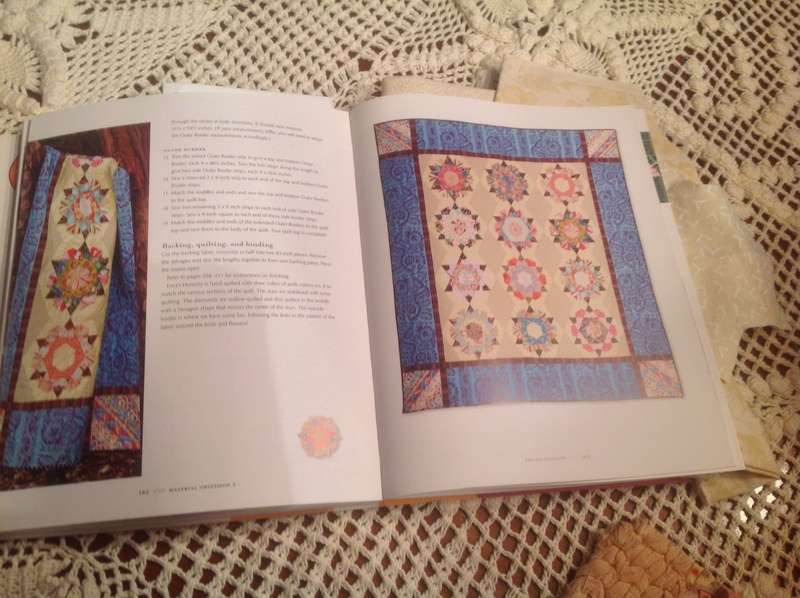 The issue is bed quilt or wall hanging. I go back and forth daily. I have a quilt on the long arm and will work on that some this afternoon. And I am listening to an Elizabeth George mystery downloaded from the library: Careless in Red. I have to finish it as Mary Karr’s Lit, which I had put a hold on, is now available. Oh my goodness!!! So many good things to do, so little time. The turkey’ gobbling is such fun. Love the new hexies. Stay safe and warm!